With that in mind, I have decided to share a bit of Indie Love in the hope that it will help out those like me who are struggling to make a name for themselves. I don’t have half as much time as I’d like for reading, and consequently I am very picky. I haven’t read and loved that many self-published books, but from now on I’m going to share with you those I have. 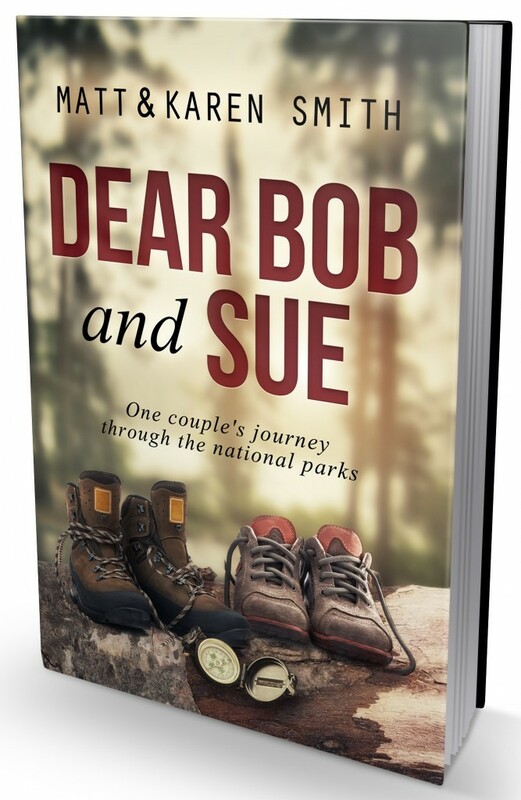 In Dear Bob and Sue the authors, a 50-ish married couple from Seattle, decide to take a year off and visit every national park in America. The book takes the form of a series of emails from them to their titular friends back home. It is a delightfully simple concept, and works very well. The casual tone is fresh and involving. The warm, honest portrayal of their marriage is as entertaining as the anecdotes about the parks they visit. The ranger replied to Karen slowly, as if talking to a ten year old, “You need to remember that it will take two to three times longer to hike back up than it will to hike down.” Karen decided right then we would do the six mile hike in two hours, or die trying. The book serves as a great taster for America’s many and diverse national parks. They describe hikes, recommend restaurants and tours – and sometimes cocktails. 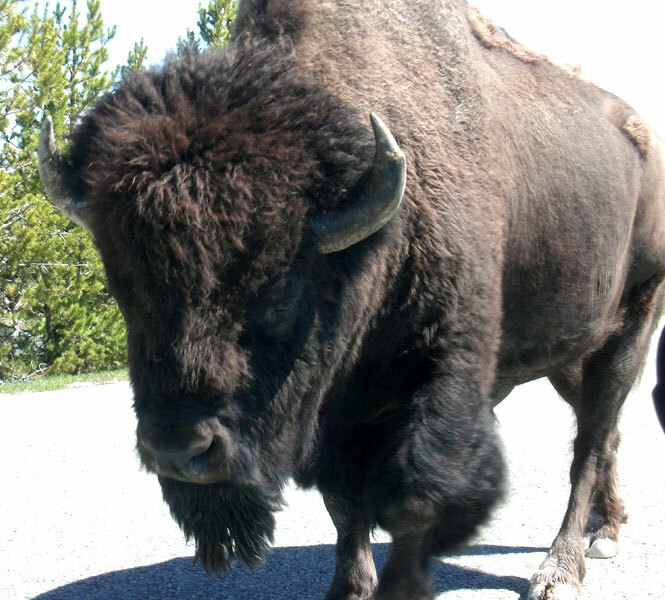 I had the good fortune in 2011 to visit Yellowstone and Glacier. Both were wonderful, and I’d love to get back to America to visit more of their wilderness areas. Thanks to Karen and Matt I now have a few locations ear-marked. Dear Bob and Sue is a travelogue and a warmly humorous portrait of a marriage. It is not the kind of book you devour in one sitting, but is very enjoyable to dip in and out of. I thoroughly recommend it. You can learn more about Karen’s terror of squirrels and Matt’s hatred of caves on amazon, facebook, and dearbobandsue.com. Please note, I am not looking for manuscripts to be submitted to me for review. As stated above, I don’t have as much reading time as I’d like, and am very particular about what I read. This is just an occasional feature I will do when the mood strikes me. One of these reading table perennials is The Golden Bough by JG Frazer, which I have been reading on and off for over 20 years. For those who don’t know, it’s a huge, rambling, early 20th century study of magic, religion, superstition and mythology – and it is full of fascinating ideas, beliefs and practices. The prose is quite dated and shows the prejudices of a privileged white male of what was still then a colonial super-power. But look beyond that, and The Golden Bough is a treasure trove of fascinating ideas. Barely a page goes by without me jotting something in the margins – though often it is only an exclamation mark. Over the years I have squirrelled away many little snippets and ideas, and every now and then I find the perfect place to make use of them. Yesterday I had great fun writing a scene (for my work in progress, Kikimora) in which the inhabitants of my fictional town decide their gods aren’t pulling their weight and need reminding of their duties. They take the god’s statue from the market square and parade it through town, beating it, and calling insults at it. They then throw it in the icy river, and tell it it will stay there until the god answers their prayers and brings the long overdue Spring. This is wonderful, entertaining stuff. If I hadn’t read it here I would never have believed such things took place. I love the idea of gods having to prove themselves and pull their weight. One of the enjoyable things about European heritage is the way that Pagan traditions have managed to coexist and insinuate themselves into newer Christian ideas. In many places it was common for people to go to church every Sunday, but still honour their household gods and spirits with little offerings and sacrifices. This interplay of Christian and Pagan ideas allows the development of fascinating hybrid customs which are a gift to a writer. One of my earliest short stories borrowed ideas from Frazer in the competition between three brothers to become their villages new Rain King (after the old one was burnt alive for failing to bring the rains). It was a very cynical story in which the most ruthless and underhand brother won, and turned out to be just the leader the village needed. I have no idea what became of it, or if anyone but me ever read it. 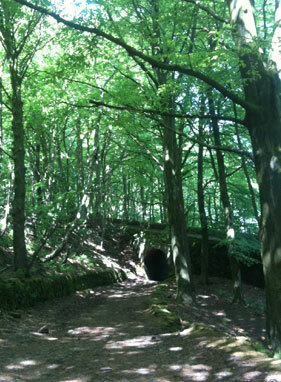 Similarly, my first (unpublished) novel had a recurring motif based on Frazer’s idea of the King of the Wood – the concept of killing the king in order to become king. It seems I owe Frazer quite a debt of inspiration. I will continue to dip into The Golden Bough now and then, when the mood takes me. You never know what odd, horrific, or amusing thing will crop up next, or where I’ll be able to make use of it. I’d be interested to hear if others have their special go-to inspirational texts? Where do you keep going back to? * I am not precious about books. I know some people are. My sister used to berate me terribly for cracking the spines if I borrowed books off her. Seriously, how can you read a book without cracking the spine? Personally I think books are to be read and enjoyed, and a bit of wear and tear proves this has happened. I’ve been greatly looking forward to the promised snow this week. Not for obvious reasons such as sledging or getting sent home from work. Not even for the hope of being snowed in with nothing to do but keep writing. The reason I’m so excited about the snow is that I want to take photos that I can use as the basis for Kikimora’s cover. 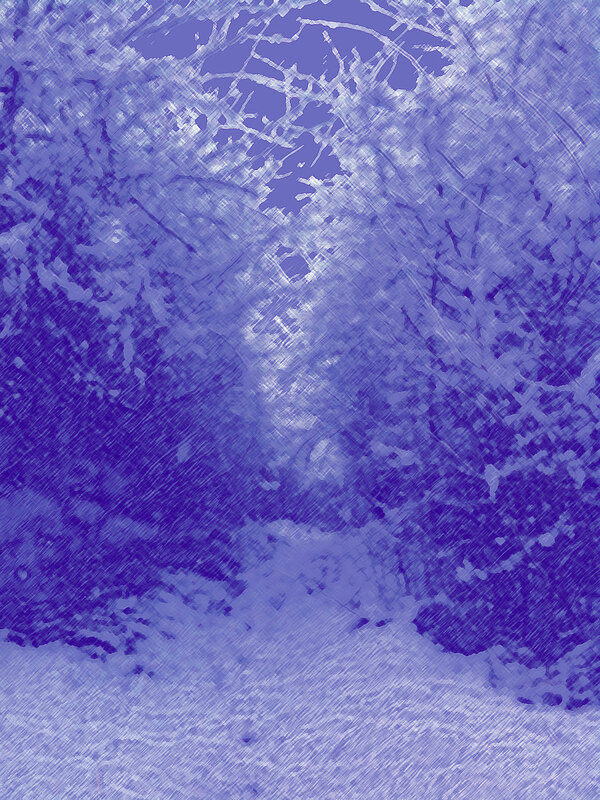 As discussed in a previous post, I have a pretty good idea of what I want on the cover, and snowy woods feature strongly. It is therefore extremely inconvenient that I’ve come down with massive lurgy, and am unlikely to be going anywhere or doing anything this weekend. We don’t get that many good snowfalls in England, and if I miss this one there might not be another all year. Fortunately, I did manage to get out for half an hour in my lunch break during the first snow earlier this week. I only had my phone with me, so the camera wasn’t brilliant. And, since it was still snowing at the time, the sky was grey and the light murky.The resulting photos aren’t that scintillating. However, I had always intended to monkey around with them, adding colours and textures and painterly effects so perhaps it wouldn’t matter too much? Having already completed today’s 1000 words,* I decided to have a play around with a few pictures and see what I could do with them. These are only quick forays, trying out a few techniques, but I’m liking some of the effects I’m getting. 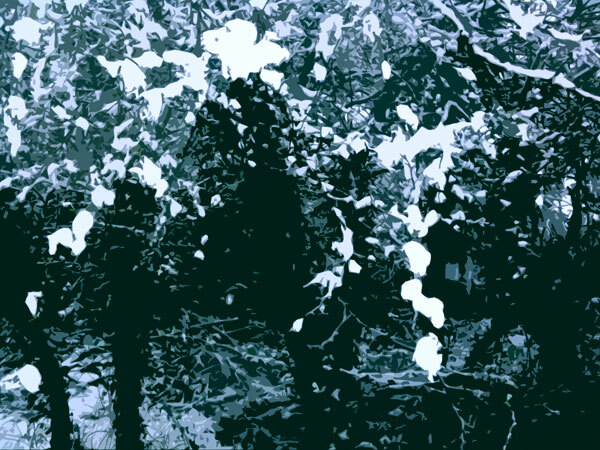 The snowy woods will be the background for a bright figure (possibly woodcut), so they don’t need to have much of a focal point themselves. 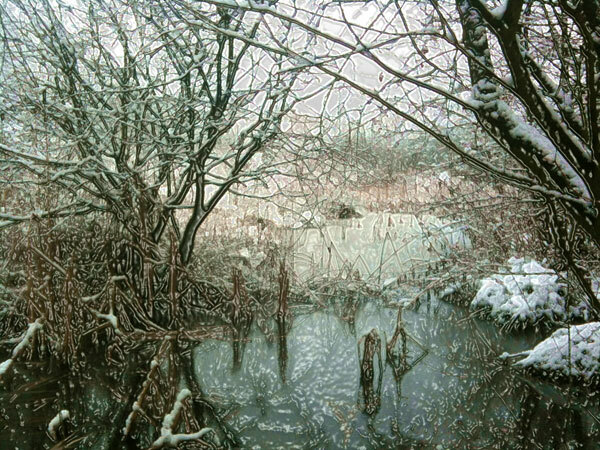 It’s also good to be able to witness a few snowfalls, since there are so many in my book. A bit of immediate, first-hand experience will tighten up my descriptions no end. All in all I’m making good use of the snow. * And I’ve had great fun with the writing today. I’ve been reading The Golden Bough on and off for about 20 years, picking up fascinating little snippets and ideas, squirrelling them away – and every now and again finding the perfect place for them in some piece of writing. Today I made use of an old custom of punishing gods that aren’t pulling their weight – by beating, berating and generally disgracing their statues. Effectively, the people give their gods an ultimatum: If you want to be worshipped then you’d better start heeding our prayers. Otherwise you’ll be face down in the river, and you can stay there and think about what you’ve done! I think this is a brilliant attitude towards religion. I wish more people had it. You can read more about The Golden Bough here, as I decided it deserved a whole post of its own. I am indeed back on that horse, the mardiness of 2012’s dying embers all but forgotten. I have been making good progress with the second draft of Kikimora. I had wanted to crack on with the major rewrite of the crisis that kicks off the climax – but had to admit temporary defeat on that one. It’s been so long since I got properly stuck into it that I didn’t have a good enough handle on the characters and their (constantly edited into different shapes) relationships. So I went back to the beginning, reading through my last round of changes, and adding in some further refinements. When I did my first draft read-through I thought the second half of the story was WAY better than the first half (which is worse than the other way around cuz once you’re suckered in you’re quite likely to continue reading. But if you aren’t sucked in fairly swiftly, then you will likely put it aside). I made a lot of changes, adding extra scenes and slowing down the story to give the characters more room to grow. Reading it back this week I was really pleased with the improvements. I’ve also now smoothed over some of the bumps that inevitably arise when you’re chopping chapters into pieces and redistributing chunks of prose here and conversations there – and some of the continuity errors. It’s been really good to get back to it. I need to maintain this pace and enthusiasm into the new year in order to get a readable draft out by the spring. I normally go to work monday – wednesday, leaving thursday and friday for writing (and weekends to see my family). It’s hard financially, but I have always valued my time more highly than money. The financial demands of Christmas and an ambitiously expensive holiday last year meant that I spent much of autumn working overtime instead of writing (which I’m sure had a bit to do with my New Year melt-down). This year I am determined to tighten my belt and just NOT SPEND ANY MONEY for as long as it takes to get back on an even financial footing. I want to keep my writing days in tact, so that the story remains fresh in my head each week, and I don’t have to waste time reading back through several chapters to remember what I’m doing..! So far it’s going well. And I have a new secret weapon in my arsenal: whenever I’m feeling insufficiently Russian,* I listen to Prokofiev’s marvellously evocative and rousing cantata, Alexander Nevsky 🙂 The only problem is that sometimes I get a little distracted – especially during The Battle on Ice. Seriously, people, give it a listen. I’d say it’s up there with Carmina Burana** in the bonkers, rousing, orchestral/choral stakes!